In the long trailer for The Girl with the Dragon Tattoo, Rooney Mara as Lisbeth Salander makes a gesture to show that her fabulous memory has recorded the documents Blomkvist wants her to read over. She raises her hand toward her head and flicks her spindly forefinger. It reminded me of how important gestures are to film performances, and how comparatively rare they are today. One feature of what I’ve called the contemporary intensified continuity style is a reliance on tight facial shots, so that actors work more with their eyes, eyebrows, and mouths than with other body parts. This solves one perennial problem actors have: What do I do with my hands? But it does cut off a lot of expressive possibilities. 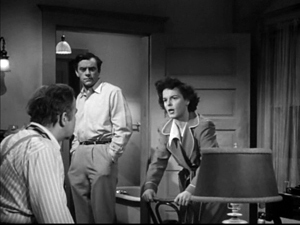 When filmmakers used more medium and long shots, actors could use all their equipment—stance, bearing, knees (as in The Cary Grant Crouch), elbows (The Cagney Cocked Elbows), shoulders. And arms, and hands. Nowadays if actors want to activate their hands in a dialogue, they usually have to lift them to their faces because the director hasn’t provided a looser, more distant framing. I’ve already shared some thoughts on eyes (and argued that they aren’t as expressive as we usually think), eyeblinks, and sleeves. I’ve written about hands before, and Tim Smith has tested some of the things I discussed. Now I’d like to write about two of the best hands in the business. Before I do, though, let’s look at some simpler cases. Rooney/Salander’s finger flip is a one-off, a staccato gesture that communicates instantly. It reminds us that she is, for all her cybernetic genius, rather nonverbal. Her dialogue is laconic, her face impassive. The gesture comes and goes like a keystroke. If there are air-quotes, this is an air-period. Something more emphatic happens in Wuthering Heights, as you’d expect from (a) the more extroverted emotion of the tale and (b) the fact that the owner of the hand is matinee idol and occasional ham Laurence Olivier. 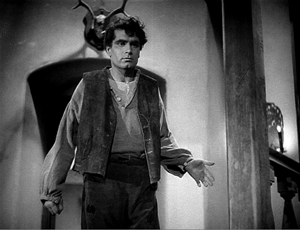 Early in the film, Lockwood is staying the night in Heathcliff’s dismal mansion. He tries to close a shutter, and finds the windowpane already broken. He’s startled by what he hears (“Heathcliff! It’s Cathy!”) in the stormy night. He also thinks he sees a phantom woman. 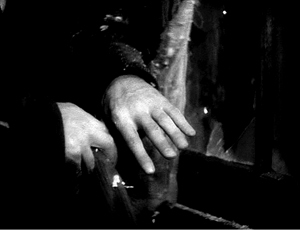 Unnerved, he pulls his hand back through the pane and stares at his trembling fingers. He stumbles from the room in a mixture of anger, shame, and confusion. Coming down the stairs he confronts Linton, who has just arrived to pick up Cathy for the party. Heathcliff stands awkwardly on the stair, his hand held at an angle, as if it’s something he’d like to slough off. 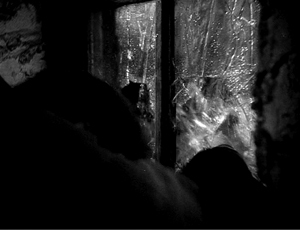 Back in his stable loft, Heathcliff smashes his fists through a window, in the manner of the broken pane that Lockwood will discover in the frame story. Later Heathcliff, now wealthy, returns to the neighborhood. When he visits Cathy, who’s now married to Linton, he initially hesitates to shake hands with his old rival. It’s a beat long enough to remind us of the class difference marked in a pair of hands. For a more unstressed example, consider The Magnificent Seven. Throughout the movie Steve McQueen invents hand business with the apparent aim of stealing every shot he’s in. At the very start, poor Yul Brynner is trying to be the brooding main attraction, ominously lighting a cigar. But Steve is making us watch him by shaking shotgun shells against his ear and then holding his hat up against the sun. Soon afterward Steve sets a whisky bottle precariously on a fence post while Yul is acting seriously serious. Then McQueen has the nerve to fiddle with his hat so that Yul can no longer ignore him. Much later Steve faces down Calvera’s outlaw band and strides into the foreground, back to us. In such a setup, the actor who turns away is traditionally ceding the audience’s attention to the frontal players in the distance. Not Steve. Once he gets into place, he swivels just a bit and swings his hand behind his gun belt. (That instant surmounts this entry.) Then he tucks one finger in his hip pocket in the lower right corner of the shot. If Tim Smith ran an eye-scanning experiment on this shot, my hunch is that a fair number of his subjects would watch Steve’s digits. McQueen’s scene-grabbing reminds us that once a filmmaker has framed the performer from fairly far back, judicious use of the hands can activate areas of the frame we normally don’t watch. 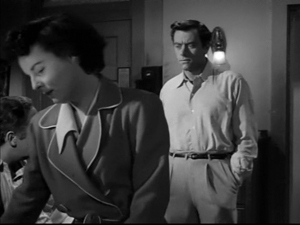 After all, in most shots the upper half carries the most information, especially with respect to the actors’ bodies. My favorite example of highlighting a lower corner remains a shot from Kriemhilde’s Revenge (above). The director, Fritz Lang, laid out his frames with the precision of an engineer. Even in a less exactly composed shot, slight hand movements down the frame can add gradation of emphasis. Smash-Up: The Story of a Woman presents some hard-boiled poker players forced to listen to a radio song that interrupts their game. They sit still, but their fingers stir a little, suggesting their impatience to get on with playing. Now we’re moving into the area I described earlier this fall as scenic density. Several of my examples there involve small gestures. 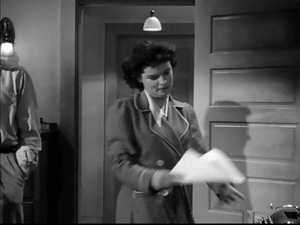 To take another instance, here’s Mercedes McCambridge in her Oscar-winning performance in Robert Rossen’s All the King’s Men. As tough campaign strategist Sadie Burke, she’s trying to explain to Willie Stark (Broderick Crawford) that he’s running as a dummy candidate for the very men he opposed at the start of his political career. (The whole movie will remind any Wisconsiner of what our Governor and his pals have been up to lately.) 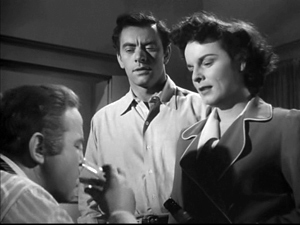 The scene pivots around drinking, and the saliency of Sadie’s hands is heightened by the fact that the men’s hands aren’t used at all. After she pours herself a drink, Sadie tells Willie he’s been framed, holding her glass at her waist. She walks away to the right, then turns and says that Willie is “the goat.” She sets her glass down at the far right of the shot. She steps toward him and leans on the chair, tipping forward. 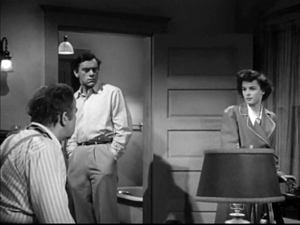 Jack Burden (John Ireland) steps to center frame and says that’s enough. But she presses in on Willie, saying his egotism has made him blind. There’s a cut to a tighter framing as Sadie faces Willie in profile. She turns away, mocking Willie, and yanks the speech out of Jack’s typewriter. She steps left to the foreground and pauses, momentarily abashed by her attack on the man she loves. Her hands do something below the frame line. Stepping back and turning away from us, she lets us concentrate on Willie. He quietly asks Jack, “Is it true?” As Sadie shifts her position, she raises her arm and we see she’s pouring another drink. Jack replies after a pause: “That’s what they tell me.” As Willie hangs his head, Sadie’s hand emerges at the bottom of the shot to offer him the drink she’s poured. A more assertive director would have cut to a big close-up of Willie and the proffered glass, but here the information slides into a rarely used area of the frame. The Kriemhilde trick, we might call it. Willie takes it, and Rossen cuts to a low angle on all three, with Jack and Sadie watching the key gesture: Willie, a teetotaler, downs the drink. Now the only hand visible is his, and the narrative momentum has passed to him. He’ll change his tactics and crush his handlers. At the end of the conversation, Ruiz cuts back to the main set-up. Because of Eugénia’s position, the purse nestles in the sort of slot that we find at the bottom of the frame in All the King’s Men above. Elisa rises and goes to pick it up, her gesture highlighting it. It contains the eighty thousand francs she is trying to return to Alberto, a love pledge he has been refusing. Elisa picks it up, then drops it back to the table, defiantly leaving it for him. By now I’d again bet that Tim Smith would find our eyes fastened on this tiny bit of the screen. Hands point us to props, and close-ups may not be necessary. 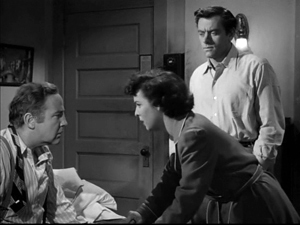 I’ve praised Henry Fonda’s handicraft earlier on this site (and in Film Art: An Introduction). Maureen O’Hara said of him: “All he had to do was wag his little finger and he could steal a scene from anybody.” But to see his long fingers and fluid wrists at full stretch, put him in a combo. There’s a remarkable six-minute scene in Mister Roberts that lets Fonda (playing Roberts), William Powell (as the ship’s doctor), and Jack Lemmon (as Ensign Pulver) make beautiful music. I can’t go through it all, but let me mention some high notes. Roberts wants to give the crew a day’s liberty, and to that end he’s bribed a port officer with a bottle of whisky he’s been saving. 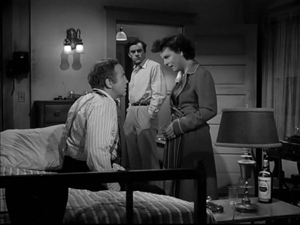 But Pulver, a lecherous layabout, has convinced a nurse to come to the cabin he shares with Roberts, and he’d planned to seduce her with the Scotch. So to help Pulver out, Roberts and Doc will concoct fake Scotch with ingredients they have at hand. As I work it out, Powell supplies gravitas, a steady ground bass of minimal, exact gestures. 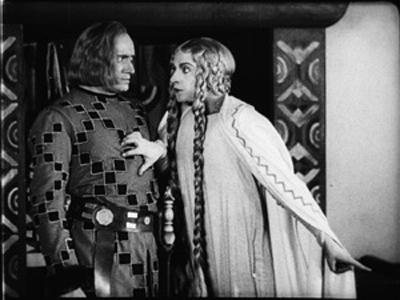 Lemmon, playing Pulver as wound much too tight, punctuates his passive role with nervous head movements and stabbing arms. He supplies percussive accents. Fonda’s relaxed but severe playing, neither stolid nor spiky, is the melody that floats through it all. At the start, after the older men have entered, Pulver is slouching, Doc is wiping off sweat, and Roberts is looking for his monthly letter requesting transfer. As Doc replaces his hat, Roberts stresses his explanation about the whisky with a quietly tapping forefinger, a gesture you can hear on the soundtrack. When Pulver realizes that the sacred bottle is gone, he jolts into activity, frantically pointing, as if in amplified imitation of Roberts. Throughout the scene, Pulver will echo Roberts’ gestures, as when the senior officer lays his arm across his belly. 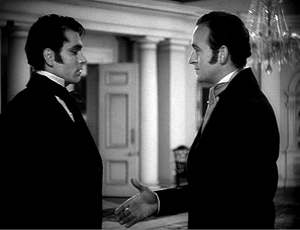 This mirror-effect is tied to the larger dramatic dynamic: Pulver looks up to Roberts, but his selfishness keeps him from being anything like his model. 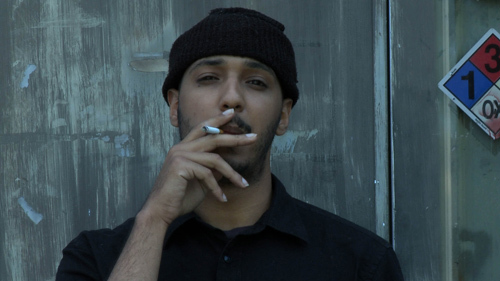 In the film’s last scene, however, he will become the new Roberts. 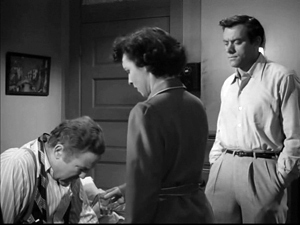 As Roberts and Doc decide to help Pulver, they give virtually silent-film renditions of the concept, “planning and preparing.” Powell roles up his sleeves, and Roberts claps his hands and then rubs them together as if hatching a plot. Hand-rubbing will be his refrain through the rest of the scene. No actors under age fifty today, I think, would dare this sort of straightforward stylization. Here’s something to do with your hands, cast members. 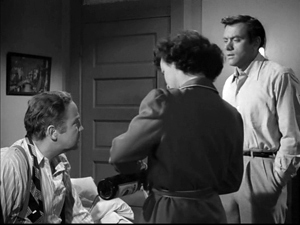 When Doc requests a Coke to add to their ethyl alcohol, Pulver yanks a bottle out from his mattress and thrusts it across the CinemaScope frame. Doc adds the Coke with surgical precision. All eyes are on his hands, while Roberts’ hands are out of frame. Pulver is still skeptical and sits back down on his bunk. The dramatic impetus passes to Fonda, whose long forefinger rests meditatively under his nose: Thinking personified. Fonda has to shift his hand in order to remark that Scotch has always reminded him of iodine. But what other actor would rotate his wrist and stick his thumb under his eye as he says that line? Try it yourself, and I bet you find it awkward. He executes it smoothly. Without having to get up, Roberts reaches back into the medicine chest and pulls down a bottle of iodine. He passes it to Doc and signals the handoff with a little flourish. Earlier we’ve seen Doc do the mixing as a solo performer, in the over-the-shoulder shot shown above. As Doc blended the stuff in other framings, Fonda kept his hands below the desk top, giving Powell the stage. But now we get two for the price of one: Powell’s meticulous adding of a drop of iodine to the brew, Fonda’s revisiting his calculating hand-rubs. Fonda’s slightly out-thrust tongue is a grace note. Pulver tries to sample the blend, but Doc beats him to it. “We’re on the right track!” he declares. Doc asks Roberts what else he’s got and Fonda, in a beautiful medium-shot with eye-catching colored medications arrayed before him, mimes the act of mulling over the next ingredient. His hand flits gracefully over the bottles and jars. They settle on hair tonic for a touch of ageing. Again Doc adds the ingredient with precise pouring, and now he prepares for Roberts to test it. Into the frame come Fonda’s hands. To accentuate the climax of the scene, Roberts rises to take the drink, forestalling Pulver. Roberts clears his palate, then drinks it, pinky extended, as daintily as a lady at a party. He stares at the glass, swallowing. Then Fonda’s hand lowers out of the frame so as to let us concentrate on his expression. His strangled line tops the whole comic arc: “You know, it does taste a little like Scotch.” Now his face does the work. All three players are reintegrated into a master shot: patient Doc, frantic Pulver, and stalwart Roberts as they realize they’ve succeeded. Pulver, after lunging with his characteristic abruptness, finishes the glass in a hunched-over gulp. You might argue that such hand jive is rather “theatrical,” and perhaps some of the business came from Fonda’s three years in the Doug Roberts role on Broadway. Even so, it has clearly been recalibrated for the cinema. 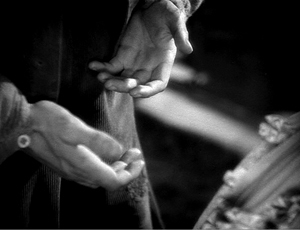 Theatre taught actors how to use their hands, but cinema gave them further lessons, and film directors learned to choreograph hands in relation to framing and shot scale. My discussion doesn’t exhaust the scene, but I hope it suggestst how choices about staging and performance can make hands carry story information and express character. They can add nuance to a moment; they can surprise us by slipping into and out of visibility; and they can inflect a facial expression or line reading. If filmmakers today lock their framing on facial close-ups and moving lips, they’re depriving us of some beautiful music. I wrote about Jim’s related project here. P.P.S, 20 January 2012: This entry’s title, as many readers noted, referenced the great Johnny Otis song “Willie and the Hand Jive.” Today Ethan de Seife writes to tell me that Johnny died the day before my blog was posted. So take it as not only an homage but a valedictory. This entry was posted on Wednesday | January 18, 2012 at 8:44 am	and is filed under 1940s Hollywood, Actors, Film technique: Staging. Responses are currently closed, but you can trackback from your own site.